VICTORIA B.C. – A balanced schedule with strong weekend and daytime dates is being announced today by the Victoria HarbourCats, as the franchise enters its sixth season (#seasonVI) in the West Coast League – a schedule that sees the team playing at home each weekend in June, five straight Sunday afternoons at home, and holiday weekends, among other features. The release of the schedule allows the team’s front-office staff to start setting up the popular 50-50 fundraising opportunities and solidify important promotional nights at Royal Athletic Park. It also allows Head Coach Brian McRae and his newly-named coaching staff of Troy Birtwistle, Todd Haney, Ian Sanderson and Jason Leone to begin planning workout dates and travel logistics. The HarbourCats will again play out of the North Division, joining the Bellingham Bells, Kelowna Falcons, Port Angeles Lefties, Wenatchee AppleSox and Yakima Valley Pippins. 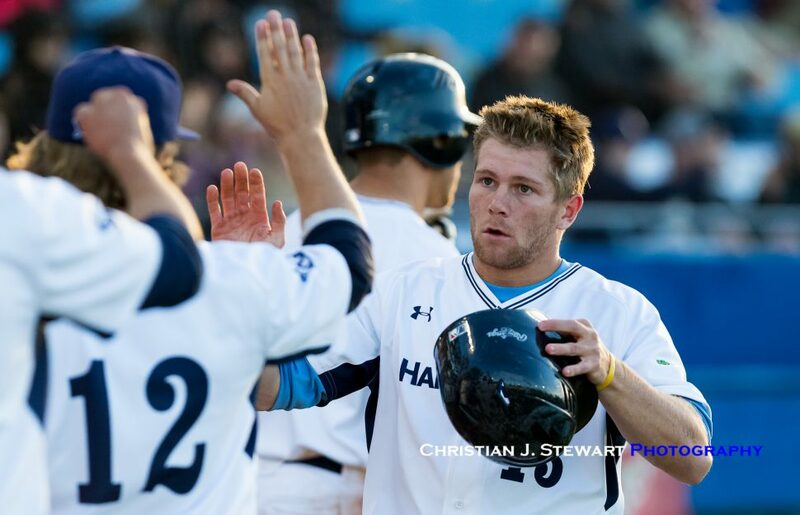 The HarbourCats and Falcons are the lone Canadian teams in the WCL. The South Division is comprised of the Bend Elks, Corvallis Knights, Cowlitz Black Bears, Walla Walla Sweets and the newest league addition, the Portland Pickles, who replace the Gresham Greywolves. The HarbourCats will open the WCL regular season at home with a June 1-2-3 (Fri-Sat-Sun) series against Wenatchee, then take a day off and face the Yakima Valley Pippins at home June 5-6-7 (Tues-Wed-Thurs). The Thursday game, June 7, will be the annual SCHOOL SPIRIT GAME, dedicated to students, and will start at 11:35am. The Coquitlam Angels, Team BC for the 2018 Baseball Canada Men’s Championship at RAP this coming August, will be at RAP for games on June 9-10 (Sat-Sun). The first road series for the HarbourCats won’t require a border crossing — a trip to Kelowna, June 12-13-14 (Tues-Wed-Thurs). That’s followed by a home series against the JDF Straight-rival Port Angeles Lefties, June 15-16-17 (Fri-Sat-Sun), the final day being the annual Coca-Cola Father’s Day home game. At this time, 29 home games and 27 road games are confirmed, with an additional five home games nearing completion (May 30, July 5-6, and July 28-29). Without adding playoffs, that will give local baseball fans at least 34 home games, and 61 games overall in a 69-day span. Season tickets continue to be sold, and individual game tickets will go on sale by the end of the week, both at the team office (1814 Vancouver St) and on-line. Other highlights include — The new Portland Pickles will be in Victoria for the final home series, August 6-8, which will include Shirt Off Our Backs Night and Fan Appreciation Night… the Kelowna Falcons are in Victoria for the Canada Day weekend… the 2017 WCL final rematch in Victoria with the Corvallis Knights is slated for July 18-20 at RAP, right after the all-star break July 16-17… The WCL all-star game will be played July 17 in Port Angeles, with two days of festivities around that… The only team the HarbourCats do not visit this year — the Portland Pickles. All WCL teams except the Cowlitz Black Bears will be in Victoria… The HarbourCats will wear the historic Victoria Mussels jerseys for two home games, dates to be determined. The team’s pocket schedule will be out shortly, and major promotional dates and activities will be announced in the new year. The schedule appears at http://harbourcats.com/calendar/, with an I-Calendar option to add it to your smart phone or tablet. Most home games will continue to be 6:35pm starts, with Sundays and some special games being 1pm first pitch. The annual SCHOOL SPIRIT GAME will be an 11:35am start time on Thursday, June 7. The WCL All-Star Game is set for July 16-17 at Port Angeles. Playoffs — first round, Aug 9-11; WCL championship, Aug 13-17.